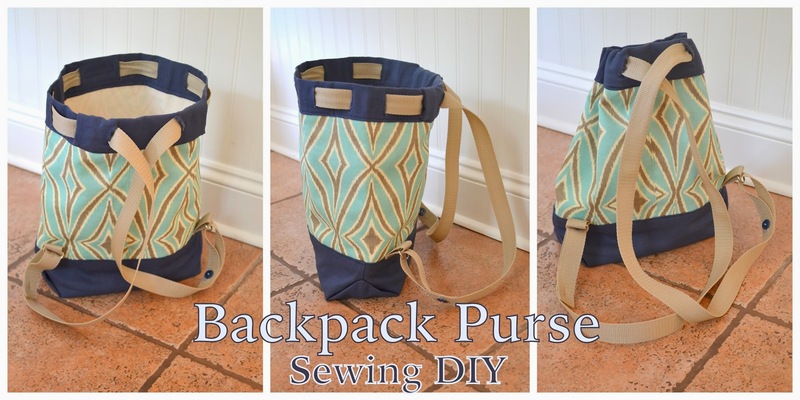 I am super excited about this sewing DIY! I have been borrowing my Mom's backpack purse since Eliana was born. I love it for so many reasons! I finally decided that the loan time may be expired so after looking online and scouring local stores for a similar purse I decided to just try and make my own. I am super excited with the final product!!! The purse in the below left is the borrowed purse from my Mom. The purse in the below right is the purse that I made. (I got a little excited and took photos before snipping all of my loose threads so, if you can, try and ignore wispy threads hanging from the new purse). I used one of my clothing labels on the front and sewed it into place so that the backpack straps don't twist around the opening. This way the beige strap is stabilized in the center so that when you pull the straps it both closes the backpack and creates straps long enough to wear over your shoulders. I hooked the straps onto the bottom with a D-ring and then found the right length for myself and attached the strap back onto itself using a buttonhole and button (see above photo). I used my Mom's purse as a pattern and just started sewing (no photos along the way). I wasn't sure how it was going to turn out... I think I may make another one and take photos during the process to create a tutorial for those who like to sew (and because I want one in another color :-) ).